Unlike the season-opening Winternationals, this 53rd annual AAA NHRA Finals event encompasses all four Mello Yello classes, including Pro Stock Motorcycle, which begins its schedule at the third NHRA event of the season, in Gainesville, Fla.
After 18 regular season events and five Countdown to the Championship races, titles will be earned this weekend in two days of qualifying and one day of eliminations. 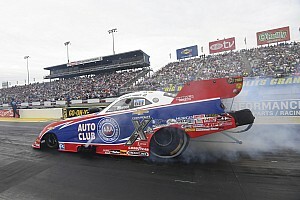 This year everything changes for the drivers and riders attempting to earn a 2017 title, as NHRA decided to award 1.5 points to all competitors in the finale. Just as it was in Indianapolis where the 1.5-point system made its debut, this tweak could prove a crucial in defining who earns top honors. There’s a maximum of 191 points, rather than 130, available to every driver and rider competing this weekend, and a competitor can earn up to 16 qualifying bonus points for being in the top position after each of four rounds. There’s 10 points for earning No. 1 qualifier and 30 points for each round win, instead of 20. One title race won’t change at the top, though, and that is Pro Stock Motorcycle. Unless Eddie Krawiec doesn’t make it down the quarter-mile dragstrip even once, the rider of Vance & Hines’ Screamin’ Eagle Harley-Davidson Street Rod has got this. Ever since winning Indy to close out the regular season, he has been on a tear, capturing four of the five Countdown races, and pulling 150 points clear of L.E. Tonglet. However, Tonglet on the WAR Suzuki hasn’t yet sealed runner-up spot, despite six wins this year. Andrew Hines (Krawiec’s teammate) is only 51 points behind him in third, with Scotty Pollacheck (Suzuki) 21 points further back. Then comes Hector Arana Jr. on a Buell, Jerry Savoie on the second WAR Suzuki, Matt Smith’s Victory, Karen Stoffer riding a Suzuki, Angie Smith on a Buell and rookie Joey Gladstone’s Suzuki. There will be 21 motorcycles competing at Pomona, so the standings below top spot could well juggle. There’s a healthy 19-car entry in Top Fuel and there will be much attention on the battle for supremacy here. 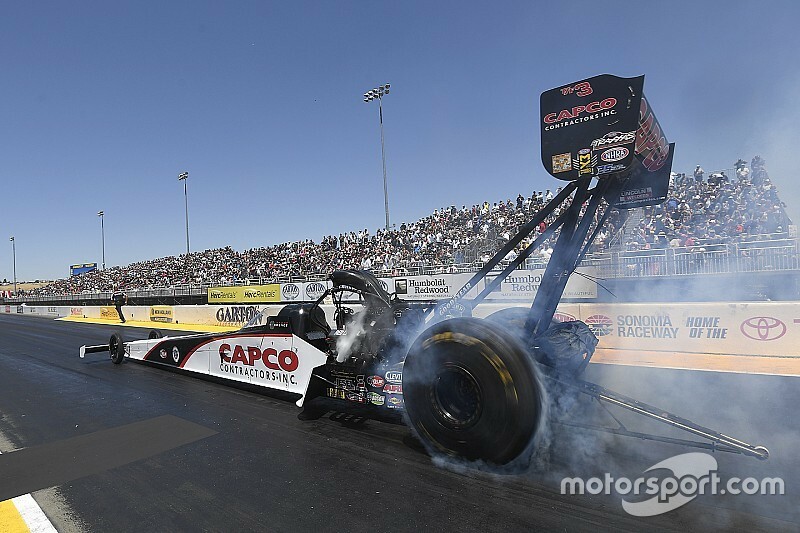 Despite eight wins this year, Steve Torrence in the CAPCO Contractors dragster leads the points standings by a meager 20 points thanks to achieving only one of his Wallys in the Countdown races. His closest challenger is John Force Racing’s Brittany Force, in a Chevrolet-badged Monster Energy dragster. You have to go back to seventh-placed Clay Millican, who earned his first NHRA win this year at Bristol, before the gap from top spot widens to 200+ points. Suffice to say Force, Doug Kalitta (1 win), reigning titleholder Antron Brown (4 wins), Leah Pritchett (4) and Tony Schumacher (1) join Millican in hoping Torrence has a horrible weekend. Among those looking to stop the regulars from gaining glory is Australian Wayne Newby, who is driving the Rapisarda Autosport International dragster. He and his team have flown in after finishing second in Australia’s opening round of racing to teammate Damien Harris. American Ashley Sanford earned a sixth-place result in that race. Mike Salinas returns to NHRA competition for his seventh race of the year in the bright orange Scrappers dragster, prepping toward a 2018 full-season attempt. The situation in Funny Car is as mixed as Top Fuel. Despite eight wins so far this year, reigning titleholder Ron Capps had to cede the points lead when his NAPA Dodge Charger R/T blew up in the first round in Vegas. The man at P1 with a 15-point lead is now JFR’s Robert Hight. For Hight, who will run a black-and-white CHP tribute Chevrolet Camaro SS this weekend, this could be a second Funny Car title to add to his 2009 achievement. 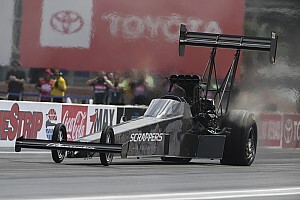 Should Capps prevail, he’ll be the first FC driver to retain a championship since John Force in 2001-’02. There are 17 others in the mix though, including Courtney Force in third place, she hasn’t won a race this year, but is only 125 points behind brother-in-law Hight and has been monstrous in qualifying all year long. The balance of the Funny Car top 10 are DSR’s Jack Beckman (2 wins) and Matt Hagan (4), John Force (1), DSR’s Tommy Johnson Jr (1), Tim Wilkerson in eighth with his LRS Ford Shelby Mustang, JR Todd with two wins for Kalitta Motorsports’ Toyota crew and single-car entrant Cruz Pedregon’s Toyota Camry in 10th. Pro Stock’s title will go to a Summit Racing Chevrolet Camaro driver, but will it be four-race winner Greg Anderson, Bo Butner (also 4) or Jason Line, who has two victories this year? Anderson, a four-time champion in the class, has 40 points on Butner and 76 on Line. While rookie Tanner Gray is in fourth and has five victories this year, he’s still 184 points behind the lead Summit Camaro; his teammate Drew Skillman is fifth (4 wins) and out of chances to take the title, but both could be spoilers for those ahead of them. Anderson has won two of five Countdown contests, while Gray, Butner and Line have earned the other three. Two-time champ Erica Enders is sixth (1 win), retiring Mopar stalwart and 2012 titleholder Allen Johnson lies seventh, Jeg Coughlin Jr holds eighth-place points, Chris McGaha (1) is ninth and Vincent Nobile, who sat out the Countdown this year retains 10th place points. There are 21 PS entries vying for the win light this weekend in Pomona. At this time the weather forecast is superb and, likely has crew chiefs smiling at their setup screens. With two qualifying sessions each on Friday and Saturday set for noon and 2.45p.m. and with final eliminations starting at 11a.m. PST on Sunday, temps are expected to range in the low- to mid-70s throughout.